I owe a huge debt of thanks to the Cape brothers, Dominic (pictured) and Nicholas. JUPITER, Fla. – Hello everyone! It has been quite a long time since I’ve updated you all. Maybe you have been following my season on my social media or other media outlets, but I would like to give you an overview from my point of view of the 2018 season. This year has been a whirlwind to say the least…. Between the 32 races, three series, two countries, three teams and 10 states I managed to take home 28 wins and 30 podiums. In that time I have learned so much, met so many amazing people and created relationships that I am sure will last a lifetime. 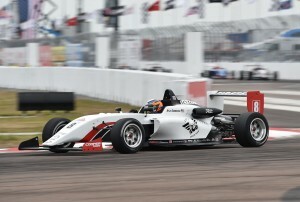 A winning USF2000 debut at St. Petersburg. Starting off the year in St. Petersburg, Fla., was probably the most stressful and anxious time of my life. 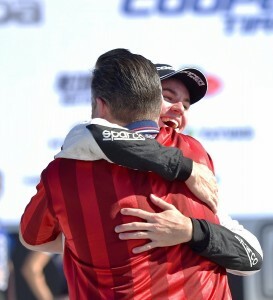 There was so many expectations lingering over my head considering I was running with the “most winning junior team” in the U.S. which had just won the Cooper Tires USF2000 Championship Powered by Mazda with Oliver (Askew) in 2017. The weight on my shoulders was massive, and little did everyone know that the partnership put together with Cape Motorsports and I was completed at the series test in Homestead, Fla., just two weekends before the first event, so there was time for only two days of testing prior to my first street race in a new car! Although, after winning the first race, all that pressure dissipated and I regained focus on what I needed to do. The race at Lucas Oil Raceway was tense in the extreme. Two months later it was the month of May in Indianapolis. The championship points were very close between Alex Baron and I, and we were neck-and-neck all weekend long at IMS. The rivalry between us was great and we had much respect for each other on and off the track. Both of us come from similar backgrounds, except from different continents. He went on to win the first race and I won the second race. Then it was time for my first oval. It was a huge learning curve at Lucas Oil Raceway – it’s very strange running so close to walls for such a long period. I gained a lot more respect for oval racers after competing in that event! Physically, yes it’s draining, but mentally I’ve never endured something so tense. To stay at the limit for that long, seeing the same things over and over again is very tough. Fortunately, the Capes and I found a really good setup and we were able to pull away with the win, while stretching our championship lead. Racing for the win at the iconic Brickyard. 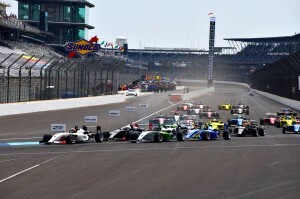 From the second race at IMS we won everything in USF2000. One thing that was kept quiet was that if I had one wreck I wouldn’t have been able to finish the season, another was if I didn’t keep winning I wouldn’t be able to finish the season either. Every prize dollar had to go straight back into the budget, and even that was barely enough. I had to take risks to win 12 of the 14 races, just so I could keep racing. And that was my mindset the entire year. For example, in Toronto I started third and fifth in both of the races and I had to attack right away to get out front because that track is very hard to pass on. It barely worked and almost resulted in a wreck in both races but hey, it worked. Next up was a triple-header weekend at Mid-Ohio, where I was finally able to clinch the title. It was a long stressful year up until this point and, thankfully, there was so little to do to become champion. It was an easygoing weekend and we were able to once again walk away with a weekend sweep and a 2018 championship trophy. That was probably the most incredible moment in my career. It was amazing to be rewarded so much for our efforts and risks we took all year. 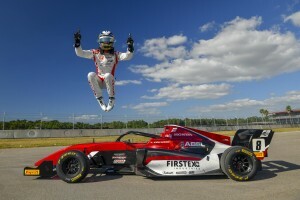 The winning habit went on with Abel Motorsports in F3. However, as soon as that weekend was over I had a new objective, which was the F3 Americas Championship Powered by Honda. Once again the partnership between Abel Motorsports and I came together super-late. Actually, the deal was finalized at Mid-Ohio, and I was in the car the next day in Pittsburgh, Pa., preparing for the race that following weekend. This time of the year was extremely busy with three weeks non-stop then one week off before the last round of the USF2000 championship. Jumping straight into the F3 Americas car wasn’t an easy task. There was added weight, size, power, downforce and an all-new team I had to get acclimated to. Even though the entries were not large, there still was a very talented group. We made some discoveries early on in the season that gave us a huge edge until the rest of the field figured it out. We were able to sweep two weekends with ease at Pitt Race and Mid-Ohio. 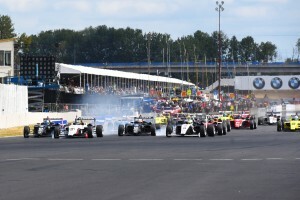 The USF2000 action was wild at Portland! 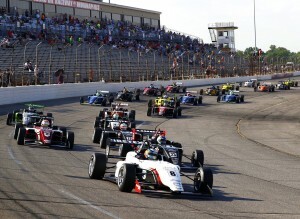 Next it was back to USF2000 in Portland, Ore. It was not easy transitioning from USF2000 to F3 or vice-versa and it showed from me in the practices at Portland where I was barely in the top 10. Part of that was our tire budget but I know the car differences had a lot to do with it. Even though I had already won the championship everyone thought it would be a good idea to pressure me to no end, asking if I could keep my streak going and if so, I would match JR Hildebrand’s record of 12 wins in a single season. I honestly wasn’t pushing to accomplish that because I knew I had already pushed my luck so far in 2018. I didn’t want to add unnecessary disappointment if I wasn’t able to accomplish that, but opportunities arose during those two races and I was able to sneak away with yet another weekend sweep to cap off the year with 12 out of 14 wins and 11 in a row. 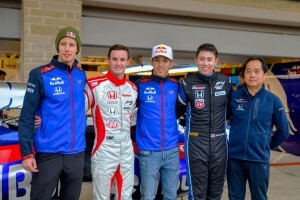 Dakota Dickerson and I spent time with the Honda F1 team at COTA. The six F3 Americas rounds were a lot more laid back then the USF2000 season. Abel Motorsports and I managed 15 out of 17 race wins. The two losses were caused by a mistake on my part and a failure on the car. The most notable weekend in F3 was the USGP at COTA with F1. This was my second time at an F1 race and the second time I have raced with F1. The atmosphere is unlike anything else. The attendance is huge and the opportunity to showcase yourself is massive. Although, at the same time it’s a little degrading seeing drivers you raced against in karting there driving at the pinnacle of motorsports! Nonetheless, the team and I were able to win both races, and the second race between Benjamin Pedersen and I was incredible. Early on I was able to pull a sizable lead and about five laps into the race I lost a winglet, which took a ton of downforce off the front. It cost me over a second a lap and I had to battle with Ben the entire race, and during the last lap we were side-by-side for eight consecutive corners! It was actually a blessing in disguise, because I proved I could overcome adversity and still take the win! 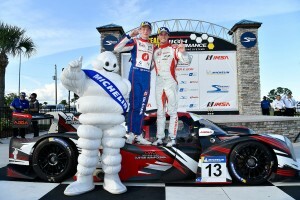 The season ended with another win in Florida on my sports car debut. I thought my season was over at that stage, and for about a week after COTA I was winding down and sorting out plans for next year. It was finally time to stop traveling! But then I received a phone call and some messages from Ansa Motorsports co-owner Patrick Madsen, asking if I would like to drive a Ligier JSP3 car for the IMSA Michelin Sebring Encore event, and of course I jumped at that opportunity. Between Ansa Motorsports, Ligier/Onroak and myself, we were able to fill a seat with me alongside Roman De Angelis. Sports Car racing is very uncharted territory for me and I didn’t have much time to get used to it considering I stepped foot into the car for the first time on Friday and raced on Sunday. But I loved it right away and was very quick after just a few laps. We went on to win and it was a battle all the way to the end. I definitely was not prepared enough for that race because about an hour into my stint I was already feeling fatigued. But I managed to keep a consistent pace and get through traffic well, which ultimately allowed us to take the win in my debut sports car race. It has been an amazing year and I am so thankful for everyone who has made this dream season come true. So ends my recap from this season, but I’ll be working tirelessly towards plans for 2019 and I’ll do my best to keep you updated when I can!